Today we're doing some kitchen chemistry using common household items. 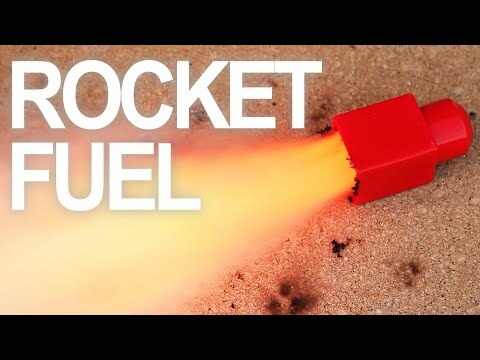 This is the type of cooking that gets me excited, because I'm experimenting with recipes for solid-state rocket fuel. [✓] Stump Remover: http://amzn.to/2cuh3ZB [✓] White Sugar: http://amzn.to/2cusX30 [✓] Digital Scale: http://amzn.to/2cisDVX [✓] Corn Syrup: http://amzn.to/2cit9Dj Thanks to NightHawkinLight for tips and troubleshooting on getting my first rocket to launch successfully! http://www.youtube.com/user/nighthawkinlight Endcard Links: Smoke Bombs: https://goo.gl/V33jIs Metal Melter: https://goo.gl/jolsPz Exploding Water: https://goo.gl/wMFjlz Paper Rockets: https://goo.gl/uluI7P See What Else I’m Up To: Instagram: https://goo.gl/C0Q1YU Facebook: http://bit.ly/FBTheKingOfRandom Pinterest: http://bit.ly/pingrant Business Inquiries: For business and sponsorship inquiries please contact us directly: http://www.youtube.com/thekingofrandom/about WARNING: This project should not be attempted without adult supervision and adequate training. Misuse, or careless use, of tools or projects may result in serious injury, death, and/or permanent damage to equipment and property. Ignition of an incendiary or explosive material may not be legal in your area. Use of this video content is at your own risk. Music By: Music by Jason Shaw (HeadingWest) http://www.audionautix.com Project Inspired By: http://www.jamesyawn.net/skillet/large/index.html Project History & More Info: This recipe calls for a 60/40 mix of KNO3 and white table sugar by weight, and I'm going to make a 100 gram batch, so I'm adding 60 grams of stump remover first, followed by 40 grams of granulated white sugar. I'll need some sort of container to hold this in, and I'm thinking these Mega Block Legos might work. At this point, the mixture is just runny enough that it can be coaxed into the container. It takes about 60 grams to fill this red block, and when I've cooked up a little more, I'll add that to the blue one. It's darker in color because it cooked longer, and generally speaking, I think the less it is cooked, the better. Another batch was made using a mix of 58% Stump Remover, 29% Sugar, and this time I used 13% Corn syrup, and 30mL water. The water was cooked out the same way as the last, and then about 1 gram of homemade rust powder was added, and stirred in throughly. When it was ready, it looked like a creamy chocolate frosting, and I packed that into the green LEGO. I may have accidentally trapped an air bubble inside. Overall I think I'm happiest with these mixtures using the rust. With a different homemade casing that actually has a nozzle, I was able to get a successful rocket launch that I think went a couple thousand feet high.